Oscar Overton’s boss had the good fortune of sitting down to a bite of Oscar’s wife Evelyn’s cheesecake back in 1949. He apparently loved it so much, he told Evelyn to get into business selling it. She did just that, setting up shop in Detroit during the 1950s. She kept at it for as long as she could, but gave it up eventually to take care of her two kids. But she continued making cakes, using her basement as a kind of sweet speakeasy to sell them. Finally, the two moved to Woodland Hills, California in 1972 where they set up a wholesale bakery. Evelyn’s son grew up to own and manage his own sandwich shop in Beverly Hills. He had a one page menu, and offered ten varieties of his mother’s cheesecakes for sale. They opened their second restaurant in 1983, then expanded their Beverly Hills location to seat 78 people in 1987. The menu also expanded at toward the beginning of the 90s to reflect the changing tastes of clientele. 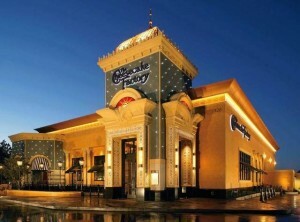 The Cheesecake Factory began a slow expansion into other parts of southern California soon after the early 90s. The company went public in 1993, changing its menu twice a year and adding vegetarian options to suit demand. The company has also expanded internationally, with locations in the Middle East and South America. You can also find a Cheesecake Factory in Dubai or the Caribbean if you are so inclined. The Cheesecake Factory also operates RockSugar Pan Asian Kitchen, which offers Asian-fusion food.